The Berkman Center for Internet & Society and its Youth and Media Project are pleased to share a new report, the third in a series discussing issues of youth and privacy in collaboration with the Pew Research Center’s Internet & American Life Project. Teens are sharing more information about themselves on social media sites than they have in the past, but they are also taking a variety of technical and non-technical steps to manage the privacy of that information. Despite taking these privacy-protective actions, teen social media users do not express a high level of concern about third-parties (such as businesses or advertisers) accessing their data; just 9% say they are “very” concerned. These findings are based on a nationally representative phone survey run by the Pew Research Center’s Internet & American Life Project of 802 parents and their 802 teens ages 12-17. It was conducted between July 26 and September 30, 2012. Interviews were conducted in English and Spanish and on landline and cell phones. The margin of error for the full sample is ± 4.5 percentage points. This report marries that data with insights and quotes from in-person focus groups conducted by the Youth and Media team at the Berkman Center for Internet & Society at Harvard University beginning in February 2013. The focus groups focused on privacy and digital media, with special emphasis on social media sites. The team conducted 24 focus group interviews with 156 students across the greater Boston area, Los Angeles (California), Santa Barbara (California), and Greensboro (North Carolina). Each focus group lasted 90 minutes, including a 15-minute questionnaire completed prior to starting the interview, consisting of 20 multiple-choice questions and 1 open-ended response. Although the research sample was not designed to constitute representative cross-sections of particular population(s), the sample includes participants from diverse ethnic, racial, and economic backgrounds. Participants ranged in age from 11 to 19. The mean age of participants is 14.5. 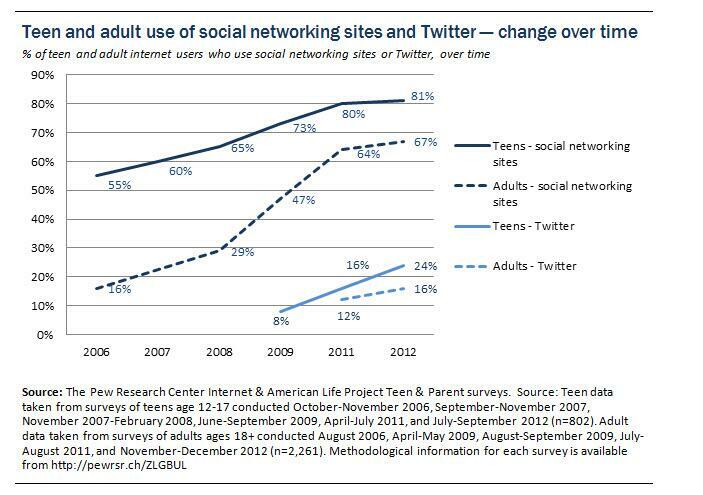 In addition, two online focus groups of teenagers ages 12-17 were conducted by the Pew Internet Project from June 20-27, 2012 to help inform the survey design. The first focus group was with 11 middle schoolers ages 12-14, and the second group was with nine high schoolers ages 14-17. Each group was mixed gender, with some racial, socio-economic, and regional diversity. The groups were conducted as an asynchronous threaded discussion over three days using an online platform and the participants were asked to log in twice per day. Throughout this report, this focus group material is highlighted in several ways. Pew’s online focus group quotes are interspersed with relevant statistics from the survey in order to illustrate findings that were echoed in the focus groups or to provide additional context to the data. In addition, at several points, there are extensive excerpts boxed off as standalone text boxes that elaborate on a number of important themes that emerged from the in-person focus groups conducted by the Berkman Center.